When I saw the word for Five Minute Friday today was “Celebrate”, two things instantly came to mind. The first was that great song by Kool and the Gang, “Celebration” (I know but remember I was only 20 in 1980 when it was released.) and the second, thank goodness fall is on its way. An odd combination wouldn’t you say? As I sit here with that song whirling around in my head like a beautiful fall leaf, I am thankful for all the seasons of my life. At every decade I have pondered what the next years would hold. The surprises, wonderful and painful, that would pop out of nowhere to challenge me, thrill me and, remind me that I’m alive. I’m glad that God’s timing is perfect. He knows when it’s time to move on. Just when I think I can’t stand one more hot day, he sends a cool morning to remind me that this too will pass. There is hope. Have you ever been in a situation or circumstance that you thought, if things don’t change, I wont’ make it? But, we do and we will because seasons change. We can celebrate that fact of life. Dry soul summers are not permanent. Seasons change. God promised it in Ecclesiastes 3 and we live it out every single day. 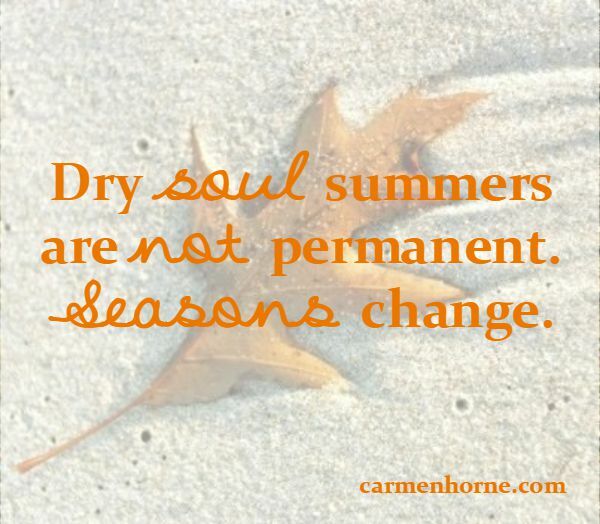 When we are in a soul summer, where our hearts are dry and wilting, even look like they are dying, fall arrives. We awake one morning and a cool breeze blows across our soul and we smile, even for a moment because, seasons change. Refreshing to note that there is hope! Hey Ifeoma! I am well. I am hoping over your way to see how things are going for you. It’s cooler here so I can finally believe fall is on it’s way. Looking forward to a refreshing. How literally cool about Kool & the Gang’s song making rounds! I love it! thanks for visiting my blog; I’m enjoying meeting so many wonderful new friends. Peace and hope to all of us. I know Leah! When I saw your post, I just giggled. That song does make me want to smile. Nice to meet you! Well, my friend… you know how I adore Autumn! So thankful that change is on the way! Oh yes Karilee! Me too. Pumpkins and fall leaves. Beautiful! Thank you, Carmen! I needed this reminder :). Summer is difficult for me because of the heat–I’m always excited by the first frost. The next time I feel like I’m having a ‘dry soul summer’, I’ll remember that fall always follows summer time! In those dry summer times, I’m so glad God sends a cool breeze to our souls from time to time to remind us it won’t always feel this way. Blessings! Glad you visited Laura! Thank you for your kind words.